E. B. O’Reilly is a leader in promoting environmentally-friendly and cost-efficient LEED-certified Building Projects. LEED-certified buildings have lower operating costs, conserve energy and water, reduce harmful greenhouse gas emissions, and are healthier and safer for occupants. LEED certification demonstrates that the building project meets the highest green building and performance measures, and that the building is an environmentally responsible, profitable and healthy place to live and work. The experts at E. B. O’Reilly will work with your engineers and architects to design and implement HVAC solutions that will help you “go green”. Call us today for more information. click here: MSCA GreenStar Qualified. 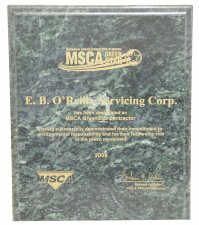 MSCA GreenStar Qualified: E. B. O’Reilly is now the FIRST contractor in the entire tri-state area (and among the top 6 in the country) to receive the MSCA GreenStar Qualification. This demonstrates that E. B. O’Reilly is a leader in Green technology by promoting sustainable technologies, possessing the needed skills to deliver energy-efficient solutions, fulfilling customer needs and satisfaction, and understanding the latest green technologies.